The Bible clearly states that all mankind is descended from one man and woman: Adam and Eve. In recent years genetic studies have shown this to be the case. One interesting outcome of these studies is support for the fact that our most recent female ancestor (Eve) is actually older than our most recent common male ancestor (Noah). Of the two lines of study, the one pointing to Eve is the most interesting. Not only does it provide compelling evidence for Biblical history, but also stands as an example of how evolutionary interpretation actually obscures evidence in support of the Biblical account, as well as the lengths evolutionists will go to dismiss such evidence. 1.1 Is this the biblical Eve? 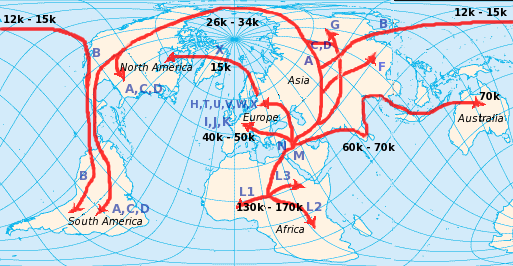 Map showing human migrations based on mitochondrial DNA mutations. The letters represent markers for individual mutations. In 1987, a team at the University of California at Berkeley compared the mitochondrial DNA (mtDNA) of several groups of people from different geographic locations. They concluded that all of these people had the same female ancestor and called her Mitochondrial Eve. They then proceeded to calculate the mutation rate based on such evolutionary assumptions as the time of our alleged divergence from a supposed common ancestor with chimps. They concluded based on this estimated mutation rate that Mitochondrial Eve lived 100,000-200,000 years ago. In 1997, a paper entitled A High Observed Substitution Rate in the Human Mitochondrial DNA Control Region by Parsons, Thomas J., et al. was published in Nature Genetics. They compared the mtDNA of many mother-child pairs and found that mutations in mtDNA occur about 20 times more rapidly than previously thought. Based on these measurements, they calculated Mitochondrial Eve lived only about 6,500 years ago. The Berkeley team measured differences in human mitochondria DNA. Parsons’ study measured the rate of change in human mitochondria DNA. When these two sets of empirical data are put together, they yield a date for Mitochondrial Eve of about 6,500 years. This is about the time the Bible gives for when the real Eve lived. The only real reason this figure is rejected is because it agrees with the Bible, while being contrary to evolution. Is this the biblical Eve? Now, it is possible that Mitochondrial Eve is not actually Eve herself, but one of her female descendants. She would be the last common ancestor of Noah's, three son's, wives. Eve could have been the last common ancestor of these three women, but that ancestor could have been one of Eve's pre-flood female descendants. It is interesting that they are still calculating the rates based on the assumption that we have a common ancestor with chimps. Like at Berkeley, they assumed evolution to get the old dates. We still have the one case where it is known that they actually measured the rate of change in human mitochondria DNA, which resulted in a date of 6,500 years. This has proven to be an excellent case study in how evolutionists assume evolution in calculating dates while ignoring dates that are contrary to it. Wieland, Carl A shrinking date for ‘Eve’ Journal of Creation, 12(1):1–3. April 1998. Wieland, Carl No bones about Eve Creation, 13(4):20–23. September 1991. First Humans To Settle Americas Came From Europe, Not From Asia Over Bering Strait Land-ice Bridge, New Research Suggests by Valparaiso University materials adapted by ScienceDaily; July 17, 2008. This page was last modified on 17 March 2015, at 11:22.